Chocolate is a favorite confection of a sweet tooth, which is made from the oil of cocoa beans. It is eaten alone or used to prepare various desserts. Excessive consumption of chocolate may lead to health problems, but in small quantities it is even helpful. There are three main types of chocolate: milk, dark and bitter. First of all, they differ in the number of cocoa. 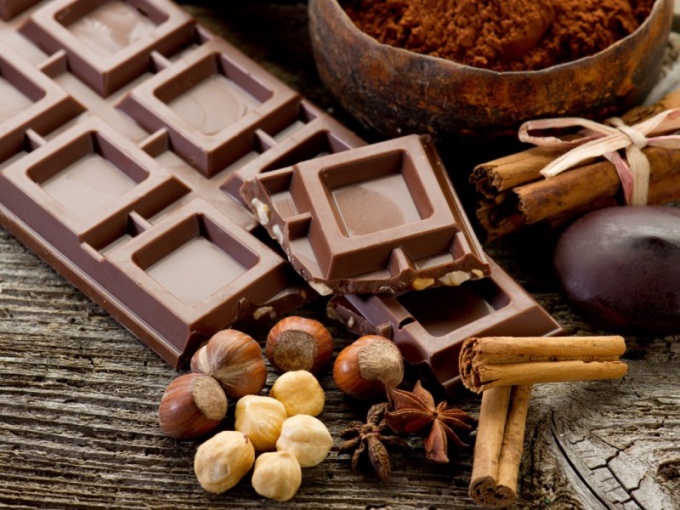 Milk chocolate, for example, the amount of cocoa can vary from 25 to 50% in dark to reach 70%, and in Gorky – up to 90%. In addition, the milk chocolate always add milk and sugar and this makes it a banned product for those who suffer from diabetes or struggle with obesity. Unlike milk, dark chocolate undergoes less different treatments, and therefore retains many useful substances contained in cocoa. Flavonoids in dark chocolate, for example, has a beneficial effect on the nervous system and helps rid the body of harmful toxins. Milk chocolate nutrients are also contained, but their numbers are lower in several times. The high cocoa content in dark chocolate helps improve blood pressure and calms the nervous system. This product actually belongs to the antidepressant because helps to reduce blood levels of cortisol – a stress hormone. And yet this bitter chocolate helps to speed up metabolism and, as a consequence, weight loss. Natural dark chocolate in limited quantities can be used even for diabetics (but only with doctor's permission), as it helps to increase insulin sensitivity. The daily amount of chocolate for each person individually. Those who suffer from allergies, skin diseases and inflammation of the gastrointestinal tract, it is better to refuse from the consumption of such a product, as even in small amounts it can trigger the development of these diseases. You should not give chocolate to young children, especially under the age of three. With three years allowed to give not more than 20 grams in a week, and it is only natural bitter chocolate. And even better – to exclude from the menu of the child of the product. Adults healthy people nutritionists recommend eating no more than 50 g of this product a day is about ¼ of a chocolate bar standard size. But in such quantities healthy is only the bitter chocolate, the amount of milk it is better to cut twice. However, note that chocolate is very nutritious product, so that the recommended rule is hardly suitable for those who struggle with excess weight. So, the caloric value of 100 g of dairy delicacies is approximately 550 kcals, and black – 540 kcal. Any additive in the form of nuts or jam will make the chocolate more nutritious.